Rated PG. Parental Guidance. General viewing, but some scenes may be unsuitable for young children. This is an Eros Internation brand of the Hindi DVD. Has the UPC Code 828970005890. Has EROS Seal. Full Screen. 166 minutes Color. NTSC FORMAT - ALL REGIONS. Dolby Digital 4 Channel Sound. MOVIE HAS ENGLISH SUBTITLES-SONGS IN HINDI ONLY, NOT SUBTITLED. CONTAINS THE SONG "HUMKO SIRF TUMSA PYAAR HAI". Written & Directed by: Rajkumar Santoshi. Music: Nadeem-Shravan. Lyrics: Sameer. Starring: Bobby Deol, Twinkle Khanna, Raj Babbar, Mukesh Khanna, Danny Danzongpa & Others. 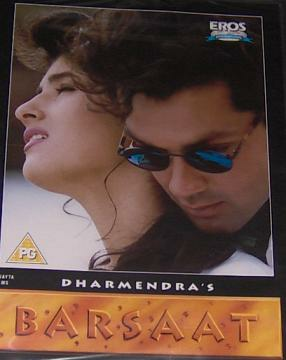 Release Date: 29 Sep 1995 (India). Badal is a naive but intelligent young man who comes from a small village to the big city. When Badal attends college, he meets with the pretty and percocious, Tina Oberoi and after a few misunderstanding and misadventures, both fall in love. This is not taken well by Tina’s dad, , who hopes to marry her with his friend’s son. Tina’s dad complains to the college principal, but Tina testifies in favour of Badal. Tina’s dad then asks a corrupt cop, Neghi, who is the city’s Assistant Commissioner of Police, for assistance. Neghi arrests Badal on trumped up charges and imprisons him. At this point Badal’s dad also comes to the big city to try and make sense of why Badal ended up in prison. Tina’s dad gives a contract to Neghi to have Badal killed, to which Neghi agrees and hires a gang of ruthless outlaws to hunt and kill Badal. He also pressurizes Tina not to acknowledge and meet Badal anymore, and Tina reluctantly agrees. Buy Barsaat-Bobby Deol (DVD, 2005), sold & shipped by Movie Time Video where you can shop online for Pooja Mandir, Bajot, Gifts, Hindi Movie DVD / CD, Music Video. This Hindi Movies collection has been tagged as BN 1 RR 2.50 9.49 sam bobby deol twinkle khanna raj babbar mukrsh khanna.